Some texts are licensed under a Creative Commons Attribution-NonCommercial-NoDerivs 3.0 Unported License. Why only some of my books are available under CC License on this web site? The promotion for humanities faculty at US universities requires publication of books with academic presses. In the last few years, some authours were able to negotiate making their books available under CC license. 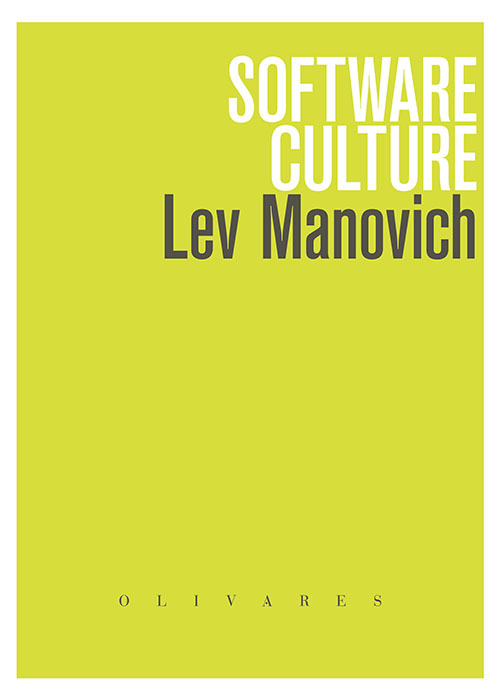 My latest book Software Takes Command will be available in 2013 under Creative Commons License (you also will be able to purchase softcover and e-book editions). However, this option was not available earlier when I was publishing "Textura: Russian Essays on Visual Culture" (Chicago University Press, 1993) and "The Language of New Media" (The MIT Press, 2001). Check Google scholar and Scrbd - you may find PDFs of the books not available here. Software Culture. Milan: Olivares Edition, 2010 (Italian translation). The new fully revised version will be published in English in 2013. Soft Cinema: Navigating the Database. The MIT Press, 2005. DVD + 40 page book. MIT Press web page for Soft Cinema. www.softcinema.net - project web site. softcinema - original web page. ZKM, 2003. (60 page book). Black Box - White Cube. Merve Verlag Berlin, 2005. (In German; translation of previously published articles). The Language of New Media. Completed in 1999. Published by The MIT Press, 2001. Translations: Italian, French, Spanish, Polish, Latvian, Lithuanian, Greek, Korean. MIT Press web page for The Language of New Media. Download PDF of book draft from academia.edu. Tekstura: Russian essays on Visual Culture. Co-editor. University of Chicago Press, 1993. The Engineering of Vision from Constructivism to Computer. Ph.D. dissertation, University of Rochester, 1993.